Sometimes it is the smallest of gestures. The Pepsi end of year pack celebrates the country, Lebanon, away from politics and shenanigans. 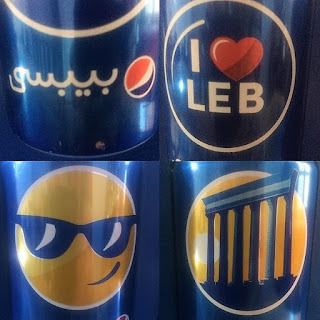 Baalbeck, I (heart) Leb, and a smiley with sunglasses.... I am not much of a cheerleader for Lebanon, but these gestures, of brands trying to do something are things I encourage.... Cheers!